It´s been a story of bad luck turning to good at BetOnline Poker recently due to the Bad Beat Jackpot being won four times in the space of three weeks. At the end of December, we reported on the good fortune of a player named “Santinhoz”, who we referred to as the “luckiest unlucky poker player of 2018” after winning BetOnline Poker´s progressive Bad Beat Jackpot twice within six weeks. At the time we noted the Jackpot hits on average every three months, but there is just no telling when it might hit again. As far as forecasts go, that was one of our better ones because, rather than waiting three months for the next Jackpot winner, we only had to wait three weeks. But then something incredible happened. BetOnline´s Bad Beat Jackpot was won again a week later, and then again ten days later, and then again three days later. In total the Jackpot was won four times within three weeks. BetOnline´s Bad Beat Jackpot is progressive inasmuch as it grows over time due to players paying a premium on the rake deducted from designated BBJ cash game tables. When the Jackpot is won, a percentage of the prize pool is awarded to the player who suffered the bad beat, the winner of the hand, other players seated at the table, and every other active player at any designated BBJ table. The remainder of the pool goes towards the site´s administrative costs and reseeding the next Bad Beat Jackpot. Consequently, if the Jackpot remains intact for months, it gets reseeded with more money. For example, when the Jackpot hit after topping $1 million last year, it was reseeded with nearly $450,000. When the Jackpot is won multiple times within a few weeks, it is reseeded with much less. Consequently, the prize pool was at its largest for the first of the four Jackpot wins when “Interesni” saw his pocket Kings improve to Quads on the Flop, only for “Pimpika” (who was chasing a Flush after the Flop) to improve his hand to a Running Flush on the Turn. “Interesni” was consoled for his loss by picking up $62,751, but subsequent winners were not quite so fortunate. The second of the Jackpot wins also involved pocket Kings improving to Quads and getting crushed. This time “DontGetTired” improving his flopped Straight to a Royal Flush on the Turn to deny “SSJkar123” a pot worth nearly $2,000. 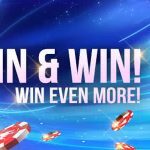 Due to the Jackpot only having being won a week earlier, the progressive prize pool was not as large as before, and “SSJkar123” collected $28,071 for his bad beat. With less money in the prize pool than before, there was even less to reseed the next Jackpot; so, when “Degtev” flopped Quad Tens and “Timemynature” went chasing an open-ended straight draw – only for his hand to improve to a Running Flush on the River – the unfortunate “Degtev” only saw his bankroll increase by $21,390. But worse was still to come due to the next Jackpot being won three days later. Jackpot #4 saw “Trueteller2013” and “superman1976” go to battle with fairly innocuous hands (Jack-Eight suited vs. pocket Tens). Neither hand improved on the Flop, but the 10♦ on the Turn gave “Trueteller2013” a Straight and “superman1976” a Set, which respectively improved to a Running Flush and Quad Tens with the 10♠ on the River. For losing the bad beat hand, “superman1976” won “only” $10,150. Since the last win of the four (on January 29th), the Jackpot prize pool has had a chance to recover and currently stands at just over $70,000. This means if the Jackpot were hit again today, the player to suffer the bad beat would collect a minimum of $12,250. It´s not as much as some Jackpot wins have been (“Santinhoz” picked up $218,157 for the first of his bad beat wins), but it´s still worth having. If you fancy trying your luck (or bad luck) at BetOnline´s Bad Beat Jackpot, head over to the site today. 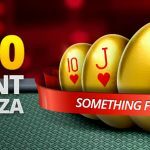 There´s plenty going on in addition to the Bad Beat Jackpot including a $1,100 daily cash race, a $3,000 Casino Happy Hour Freeroll, and a $5,000 weekly Sit & Go Leaderboard Challenge. 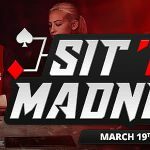 If you have never played at the site before, you will also be eligible to take advantage of the site´s first deposit bonus and $10,000 New Player Freeroll – details of which can be found in our BetOnline Poker review.